Governor Charlie Baker and Mayor Martin J. Walsh joined GE chairman and CEO Jeff Immelt and Ann R. Klee, vice president of Boston development and operations, for a groundbreaking for the company&apos;s new headquarters in Fort Point. General Electric on Monday officially kicked off construction for its new $200 million headquarters overlooking the Fort Point Channel, just over a year after the industrial giant made the decision to relocate to Boston from Connecticut. 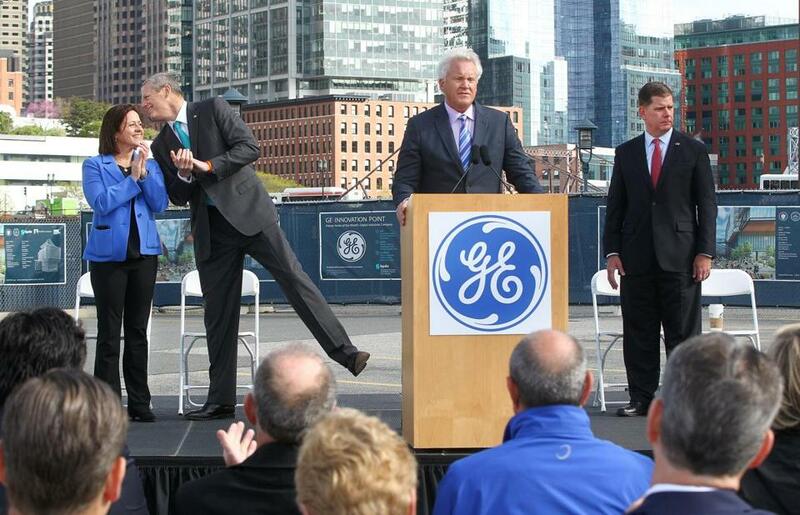 Mayor Martin J. Walsh, Governor Charlie Baker, and GE executives Jeff Immelt and Ann Klee all spoke to the crowd. Each of them retold elements of the story of how the company decided in January 2016 that it wanted to be in Boston, to be in a place considered a hotbed of innovation. “This town is going to be one of the most important cities in the world, and GE can be part of that renaissance,” said Immelt, GE’s chief executive. GE plans to renovate two old brick buildings, originally part of the Necco candy manufacturing complex, and build a 12-story tower designed by Gensler, the architectural firm, on an adjacent parking lot. The company employs about 200 people at temporary headquarters offices nearby and plans to move into the new, 2.7-acre campus in phases, starting next year and finishing in 2019. Eventually, about 800 people are expected to work in the nearly 400,000-square-foot complex. Suffolk Construction will manage the headquarters project. Consigli Construction will restore and renovate the two older buildings, which will be owned by MassDevelopment, a quasi-public agency that coordinates economic development for the state. To lure GE here, the Baker administration promised at least $125 million in grants to help with the headquarters development, and the Walsh administration pledged $25 million in property tax relief over 20 years. Meanwhile, GE made its own philanthropic commitment: $50 million to local causes, namely education and public health, over the next five years. The size of GE’s incentive package and the company’s reputation for how it handles taxes drew a small group of protesters, affiliated with the Make GE Pay campaign. They chanted and sang “Take Me Out to the Tax Game” (to the tune of “Take Me Out to the Ball Game”) from outside of a fenced-in area during the speaking portion of the groundbreaking event.